So often we are teased into thinking a movie is going to be good. But after about 15 minutes, the horrifying truth begins to set in. Jeepers Creepers has a very promising opening. Gina Philips and Justin Long star as sassy siblings driving home from college. They take the scenic route through the vast emptiness of middle America, and along the way witness some suspicious things. So far, so good. Then the rest of Jeepers Creepers unfolds in a series of unanswered questions, implausible actions from the main characters, and pure goofiness with no real point. Philips and Long are presented early on as pretty reasonable, intelligent, and keenly aware of horror movie cliches. However, once they are in the thick of the horror, they seem to forget everything, and their characters stand around waiting to get killed. This aggravates me to no end. Why make a point of having your characters talk about what not to do in horror situations and then let them do it anyway? Instead of being done like satire, it just feels lame. What about the Creeper? What is he? What does he want? What's his story? Don't expect a single answer. Not even good speculation. Fooey! He dresses like a gunslinger, drives a freaky truck with a freakier horn, eats tongues and other assorted body parts, and has wings. Did writer Victor Salva throw a bunch of horror elements in a hat and play "construct a creature"? The only thing missing was lame one-liners right after each kill (thank God). It's all right to have a mysterious bad-guy/monster, but throw the audience a bone or two. If you aren't going to attempt an explanation, at least provide a character that might know something. The best Jeepers Creepers can do is a frumpy psychic woman that no one (not even Salva) takes seriously. One more thing... Why exactly does the local police department here in "Middle-o-Nowhere, USA" have more cops than the one in Terminator? If it had anything to do with the Creeper or the plot, no mention of it was made. It's best to start with the creature. Figure out what he is and why...even if you don't share that information with the audience. Maybe Salva did this, but there's certainly no evidence of it. Drop a few clues. Sure, this is supposed to be a franchise, but why save the explanations for parts 2, 3, 4, and 5? All he did here was provide a set-up where the Creeper only strikes out in search of things to eat every 23 years. What??? That's worse than The Beast Within (boy turns into cicada after 17 years of percolating). Let the characters stay smart. Intelligent characters in a horror film are so refreshing. People watching these movies hate to see characters do things that make no sense. When the situation calls for running, the characters should run. Who is gonna stand around waiting to see what the mysterious creature will do next? A creature as indestructible as the Creeper, that's apparently been around for decades, would not find himself in a thriving community of oblivious people. Yes, the area was remote, but there were plenty of residents at the diner, and of course, a whole squad of cops at the station. This many people would know about the Creeper. In fact, if they hadn't already flown the coop, they probably would worship it. This provides you with characters that might know a little about the Creeper, and what he's after. The psychic was wasted. She should have been a more powerful and intriguing character. She could have been the one person that does know all about the Creeper, but maybe she's afraid to say too much. Or, she's the only person that doesn't worship the thing, and wants to save the main characters. There are already plenty of horror franchises that have bad guys that keep coming back for more. 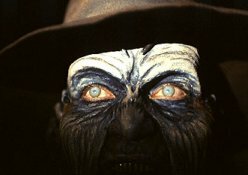 Jeepers Creepers could have been something very fresh and new, but couldn't make up its mind what it was. You can't conjure an entire horror movie from one old song. Didn't they ever see Sleepwalkers?